Roya Mattis is a mover and shaker in Mary Kay Cosmetics. She is a top director and personifies the image of success Mary Kay Inc. would have you believe is attainable. 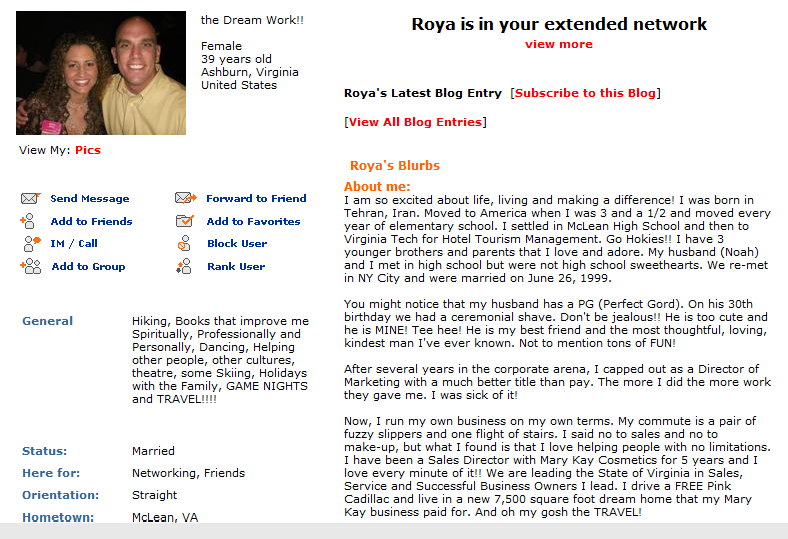 Roya has a compelling story of success, so why would she feel the need to lie to make the story even more sensational? Mary Kay I-Stories are out to get you. Really. The primary purpose of these emotion-packed, sounds-too-good-to-be-true testimonies of Mary Kay consultants, directors, and NSDs is to get you longing for whatever its teller claims to have received from their Mary Kay business. With any luck, you’ll be signing a Beauty Consultant Agreement long before Sam and Frodo get back from dumping the One Ring into Mount Doom, and what’s this? Why, those little hobbits are so brave, they even left some Mary Kay goodie bags and lip gloss samples with the Mouth of Sauron! Mary Kay Ash said to never prejudge people, after all, and you never know, the Mouth of Sauron could be your next team member! Just make sure you tell him that if he’s looking to make it as a director, he’ll want to keep the Card of Visa close by. Moving on. Because Mary Kay I-Stories are crafted with the intention of bringing in fresh recruits, sadly, the temptation to embellish them is off the charts. Embellishment’s fine when you’re telling ghost stories around a campfire or pulling a Franzia-fueled all-nighter with your scrapbooking peeps, but Planet Mary Kay seems to define ethics differently than the rest of the solar system. Read that again. “What matters is what IS going to happen.” Except that what “IS” going to happen has not happened, and therefore to present the “IS” as fact (instead of admitting that it’s nothing more than wishful thinking) is extremely misleading. Note Mattis’ choice of words. She didn’t say “paying for.” She used the past tense, “…my Mary Kay business paid for.” That means anyone within a thousand miles of Mattis’ I-Story will conclude that Mary Kay completely paid for her dream home and – quite possibly – race to join Mary Kay thinking they’re going to make enough money to pay for their own dream homes, too. 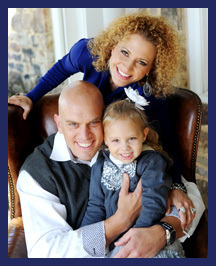 Roya and her husband purchased their home on 3/2/04 for $712,268 with a mortgage of $569,800. One year later, they took out a second mortgage in the amount of $185,000. Add it up: $754,800 owed. In October 2012, they refinanced the first mortgage in the amount of $558,000. That’s almost as much as they originally borrowed EIGHT YEARS AGO, and that second mortgage went to $65,000 under a mortgage modification agreement. Modification agreements are generally done because you are in financial distress. They’re often done because you haven’t been paying and/or need new terms in order to not default. It’s also important to note that the public records list the size of the Mattis home as just under 4,000 square feet. Roya’s fiction has almost doubled that! If you count the garage, you get up to about 6,300 square feet, but that’s still a far cry from 7,500 and normal people don’t count their garage when quoting square footage. Mattis’ fibbing doesn’t stop there. Remember the “FREE pink Cadillac” she referenced earlier? To earn the use of the Cadillac, Mattis must get the consultants underneath her to order (not sell) enough Mary Kay products to meet the quota attached to the car. Failure to meet the quota means Mattis must pay a co-pay (which can spike as high as $900 for the Cadillac) or she will lose the car entirely. So while Mattis’ “free pink Cadillac” claim looks good on paper, nothing could be farther from the truth. Well, nothing except that whole “I live in a new 7,500 square foot dream home that my Mary Kay business paid for” bit. In the second part of this article, we’ll examine two more income claims made by Mattis. Did Mattis’ Mary Kay business really allow her husband to retire from Corporate America? Is her Mary Kay business really her family’s “sole support?” Stay tuned! Note: Roya Mattis was contacted multiple times about her income claims and offered the opportunity to provide clarification. She declined to comment. Good. Call her out. I heard countless “I-stories” like this one and when I wasn’t achieving the results they were, I asked myself over and over again, “what is wrong with ME?” Sadly, these MK higher-ups continue to lie to get whatever THEY want, all while telling you that they want to help you. What a load of crap. Excellent research. I look forward to part 2! I’m just sitting here wondering, when do the HONORABLE or at least ethical, remaining Directors and NSD’s stand up and police their own ranks, by putting a stop to using all this false info and repeated story embellishing? Mary Kay Corporation! When will YOU? What’s the difference between this and a man trying to get investors into a scheme using a bogus prospectus? Why isn’t this prosecuted?? At the very least it’s detrimental reliance. Maybe it’s time for a WORLD WIDE class action suit. Imagine the numbers, in the hundreds of thousands, who can prove they were harmed by the false claims of Mary Kay’s leadership..and EVIDENCE? We have all the evidence we need in the countless unbridled sales training documents that they have PROUDLY spewed over 50 years! ‘Excuse my French, Mary Kay, but you should be shitting your pants with what Scribbler uncovers. Uh… yeah. It would be none of our business if she had not used the lies to further her recruiting efforts. If she had kept quiet, no one would care about her house, the size, the cost, or the mortgage. But since she had to lie (BIG HUGE LIES, by the way), we have every right to look into public records and other things published by Roya to verify her statements. Absolutely Tracy. The exaggerations, tall tales, and lies of ommissions are told with impunity. If they use these lies as a way to snare unsuspecting women then they need to answer to the lies when someone confronts them on it head on. Don’t start crying its personal or its no one business. If it was so personal then it shouldn’t be paraded around like its a fact. Amen Sister! They USE this info to entice. Any other financial offering involving LIES, (Think Madoff) is a CRIME. If you were any sort of “friend,” NSD Caterina Harris, you’d have pulled your dear friend Dacia aside and told her how disgusting and unacceptable it is to teach other women how to lie to their customers, then told her to issue a retraction for said teaching. If someone broadcast lies, giving the impression of truth, for all to hear, read, then they need to be called out and corrected in the same manner their words were delivered. They basically are giving permission for research, investigation on what they say true or false information. What the MKC world have forgotten about are the incredible women that were in MKC. The ladies here on PT. We are women that are leaders. We believed in find a way make a way, but with integrity and truth. We believed in the dream, but were duped, lied to like the story above. We are going to use that same enthusiasm we had for the lie, for the truth, and take MKC down. I really like this article and the comments that have been expressed. I don’t think you can be completely truthful about presenting the MK opportunity AND work “conscientiously and diligently” to recruit bodies. If everyone presented the the MK opportunity in a “truthful” manner, few would join. I swear, there’s more truth to be had in a North Korean newspaper than within the ranks of Mary Kay Cosmetics. Great article! I can’t help but believe that we will watch the MK crumble in the near future. Thank you for this article, and thank you also for your consistency in pointing out the holes in these MK stories. It is a pleasure to read the truth. Scrib, thanks for this. Thank you for showing the numbers… the proof that this woman’s I-Story is a scam. Does this mean she is lying to us? Yes indeed! Liar liar, pants on fire! I’ve just been chasing my tail trying to keep up with the lies. But if you refuse to “get the facts” (the real ones, not MK facts) you are perpetuating the lies and are just as guilty. I extend a warm welcome to the Firecracker and the Tiger as well. Whether you’re a part of Mattis’ team or no, I am happy you made it here. I think we can all agree that leaders who lie instead of choosing to be honest with themselves (and their units) are NOT the sort of star one should be hitching any wagon to, and it certainly doesn’t follow the Golden Rule. I remember being at an MK event (either in ’09 or ’10) and NSD Lisa Madson was talking about how to put together our I-stories. She mentioned that if we didn’t think ours were good enough we should “borrow someone else’s”. I remember precious little from the event but that one line has stayed with me. I figured it’d be more than appropriate to add a few examples of other Mary Kay leaders who are conveniently leaving out information in their I-Stories. 1. NSD Gloria Mayfield-Banks’ husband has owned his own very successful construction business since the 1980s. Gloria likes to tastelessly flaunt her wealth and crank out shallow Tweets that involve the phrases, “Wow!” and “Shut up,” but I’ve yet to see her give credit to her husband for HIS hard work (and money) as opposed to constantly giving the glory to Mary Kay Ash. Going by Roya Mattis’ example, I think we all know how that whole “My business paid for my home” thing goes. Pat forgot to mention that her husband Tim was an Air Force pilot who had retired and begun flying with Delta. I’m sure his income/AF retirement pension had absolutely NOTHING to do with that custom-built home. Shirley forgot to mention that her husband Bob was a corporate executive who more than likely did not do his job for free, and while the ski trips seem lavish, it’s interesting to note that those weekend ski trips took place BEFORE her life in MK and therefore, would be pointless to mention in an I-Story. 4. NSD Shirley Oppenheimer claimed, “We built a $250,000 home with my Mary Kay income.” Shirley forgot to mention that her husband Cliff was medically retired from the Air Force, so again, clearly the financial contributions of one’s husband mean nothing in the Mary Kay World. NSD Gill is the ONLY NSD I have come across to openly admit that her money was not all due to Mary Kay. Would it be so hard for Mary Kay leaders like Roya Mattis and these other NSDs to follow her example? Shamefully I spoke in front of large groups of consultants and told them about how great business was and how my income was soaring. All the while my husband was having a nervous breakdown and I was sitting at my computer staring at a blank screen,as we went into bankruptcy and lost almost everything. Not MK’s fault that we made bad decisions. I take responsibility for overextending. However, it was not helpful when I tried to talk to my senior director about my situation and she to me she was broke too. Then a week later when she got her words together, she told me to not be a victim of circumstances and I could “fix” our situation by selling and recruiting. Unfortunately I did not have good results and I finally threw in the towel. That was a good financial decision and good for my mental health as well. How long can you sanely justify a business that makes no money?! I so remember getting a “LOVE CHECK” that I owed the company $400.00 for a charge back! Ouch! Love is not a word I use to describe that check! Keep up the great work and sharing all the lies many, many, many NSD’s and SD’s tell others to achieve their personal goals.